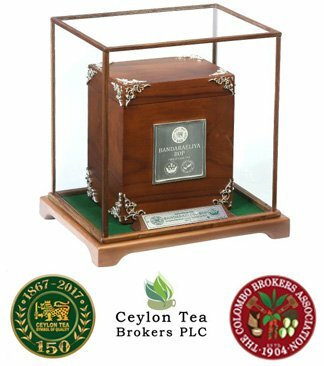 The Colombo Brokers Association, in collaboration with the Sri Lanka Tea Board and the Colombo Tea Traders' Association, will conduct a Grand Charity Auction on July 20th 2017, to commemorate the 150th Anniversary of Ceylon Tea, the commercial cultivation of which commenced in 1867. 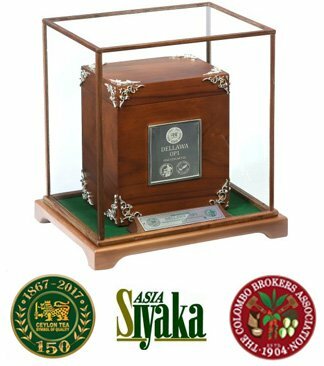 Memorabilia uniquely associated with the legendary Colombo Tea Auctions will be offered for sale as Limited Editions, specially crafted for the event in sterling silver. These items will be of great potential value and would, doubtless, be a prudent investment for the future. 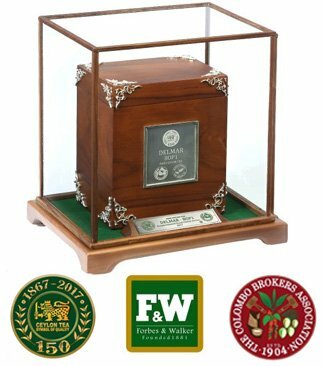 When we reach the next milestone in the history of the Tea Industry, fifty years hence, their intrinsic value would have enhanced quite significantly, apart from their worth as an object of art. The 8 Brokers will each auction a set of 6 items, individually. John Keells, as the Broker with the longest history, will be granted the privilege of auctioning an additional decorative tea chest. In total 49 items will be on offer for dedicated Buyers to acquire. 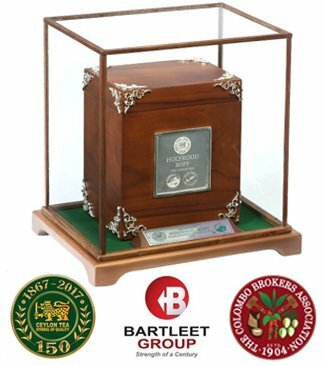 All proceeds from this charity auction will be utilized on welfare projects for the benefit of the children of the tea industry. These would include initiatives relating to education, health, sanitation, drinking water and community development. 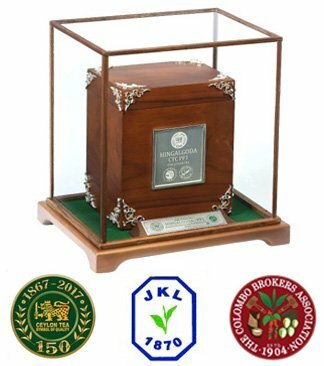 Your generosity, through active participation at the Charity Auction, will contribute towards the improvement in the quality of life of future generations of tea industry employees. We depend on your support, as an act of goodwill to those who have helped sustain this great industry for 150 years. 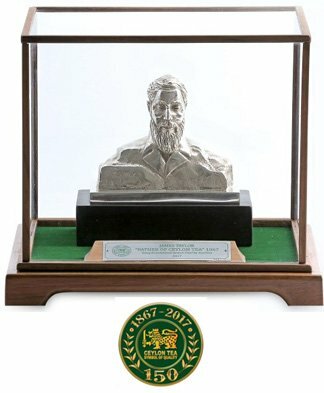 A miniature replica, mounted on a timber base, of the sculptured bust of James Taylor; which was unveiled at the Head Office of the Sri Lanka Tea Board, on January 19, 2017, inaugurating the celebration of the 150th Anniversary of the Ceylon Tea Industry, James Taylor is acknowledged as The Father of Ceylon's Tea Industry; as he developed the first commercial plantation and initiated the formal manufacturing process of Ceylon Tea on Loolecondera Estate, Hewaheta, in 1867. A miniature replica, mounted on a timber base, of the first manually operated Tea Roller, called the "Little Giant", developed and manufactured in 1880 by Walker & Co., used in the manufacturing process of tea. 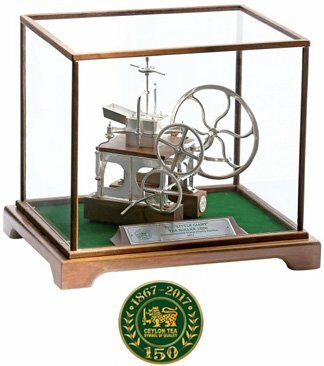 This antique piece of machinery, which is believed to be the only one of its kind in existence, had been abandoned and was retrieved, authentically restored to working order and is now on display at the Tea Museum in Hantane, Kandy. 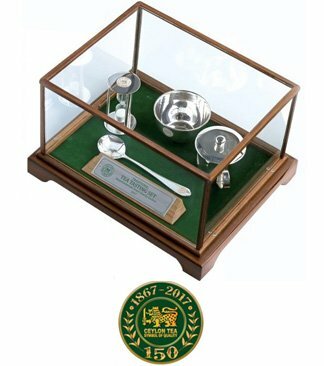 A replica of a set of traditional utensils used in the tasting and evaluation of teas, comprising a tasting cup, an infusing jug with a lid, all usually crafted in ceramic or porcelain, a tasting spoon and a 4 minute sand timer. The process of infusion entails weighing precisely 3 gms of dry tea leaves into the infusing jug and pouring 110 cc of unadulterated water, on reaching boiling point, into it. Thereafter, the infusing jug is immediately lidded. Approximately half way through the infusing duration, the contents of the infusing jug are gently stirred. On completion of the prescribed 4 minutes, the brewed tea is poured out of the jug, with its lid firmly in place, through the serrated edge of the rim, which is located diametrically opposite the handle of the jug, into the tasting cup, so as to ensure that the liquid is strained from the infused leaves. The infused leaves are settled on the upturned lid of the jug, which is then placed on the jug, for the Taster to evaluate visually and olfactorily. The Taster then draws a reasonable quantity of the liquid tea, either using a spoon or directly from the cup, into his palate, swirls it around his mouth and, having identified its inherent characteristics, discharges the liquid into a specially constructed spittoon on casters. 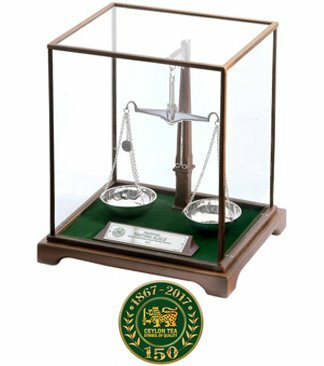 A replica of a traditional Weighing scale used in the process of uniformly brewing representative samples of tea for the purpose of tasting and evaluation. This type of scale is known as an 'Equal Arm Balance' or 'Trip Balance', and is reputed to be very accurate and practical in handling. It incorporates two pans on opposite sides of a lever, and, for use by the Tea Trade, is usually crafted in copper, with a small coin-like object, also in copper, weighing exactly 3 gms, attached to one pan. The dry tea leaves are placed in the other pan, ensuring that each cup of tea brewed for purposes of comparison and evaluation are subject to consistent parameters. 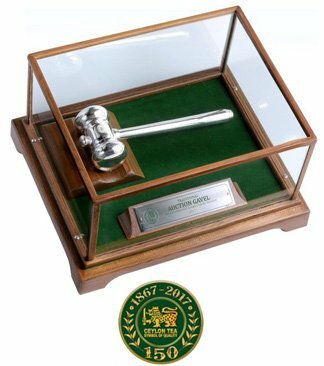 A replica of a Gavel, which is a small ceremonial mallet, commonly made of hardwood typically fashioned with a handle and often struck against a sound block, a striking surface typically also made of hardwood, to enhance its sounding qualities. It is a symbol of authority and is used by the Presiding Auctioneer on the rostrum at the Tea Auction, by striking it on the block to signify the conclusion of the sale transaction of each invoice of Tea on offer. 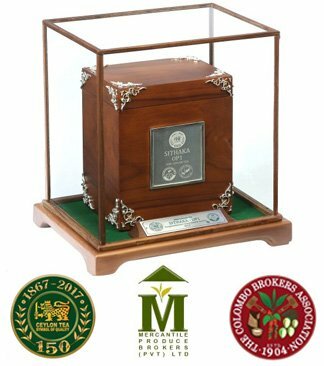 The Pièce De Resistance will take the form of a Casket crafted in Sterling Silver and Wood and tastefully studded with Ceylon Precious Gemstones, containing 500 grams of finest Ceylon Tea. 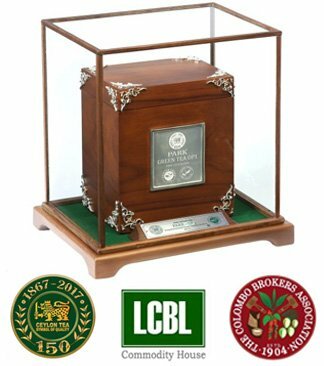 The Buyer of each casket will also receive from the particular Selling Broker 5 kgs of the best quality Ceylon Black Tea representing one of the seven distinctive Agro-climatic tea growing regions of the country, or a fine Ceylon Green tea. The entire proceeds of the Auction will be utilized for two judiciously selected Charity Projects to be conducted in the high and low elevation tea growing areas, for the exclusive benefit of the children of plantation workers.